April 2017 – "Your Dying Charlotte"
Here is a full and excellent article on how Victorian women cared for their hair by historian Mimi Matthews. Thrills and pomade await, gentle readers! Speed! 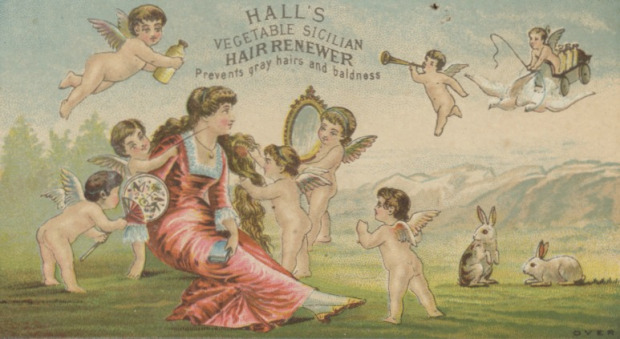 Hall’s Vegetable Sicilian Hair Renewer, 19th Century Advertisement. Since biblical times, a woman’s hair has been known as her crowning glory. This was never more true than in the Victorian era – a span of years during which thick, glossy hair was one of the primary measures of a lady’s beauty. But how did our 19th century female forebears maintain long, luxurious hair without the aid of special shampoos, crème rinses, and styling treatments? And how did they deal with hair-related complaints such as an oily scalp, dry, brittle tresses, or premature greyness?